Sensational six-piece set of liquid eye shadows featuring three Shimmer & Glow and three Glitter & Glow shades. High impact, lustrous color. Long-lasting sparkle that stays put. Glamour-eyes this holiday season with six show-stopping shades of glow! Includes: Three deluxe Shimmer & Glow Liquid Eye Shadows – high shimmer sheen, minus the glitter! Three deluxe Glitter & Glow Liquid Eye Shadows – dazzling, ultra-sparkle finish. 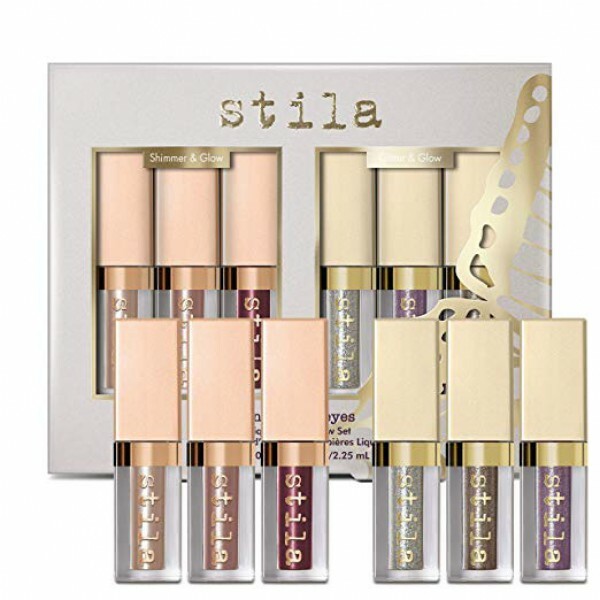 Sensational six-piece set of liquid eye shadows featuring three Shimmer & Glow and three Glitter & Glow shades. High impact, lustrous color. Long-lasting sparkle that stays put. Glamour-eyes this holiday season with six show-stopping shades of glow! Includes: Three deluxe Shimmer & Glow Liquid Eye Shadows – high shimmer sheen, minus the glitter! Three deluxe Glitter & Glow Liquid Eye Shadows – dazzling, ultra-sparkle finish.